Lesmahagow has always been on the main route between Glasgow and Carlisle, from the times of the mail coach route to the motorway today. 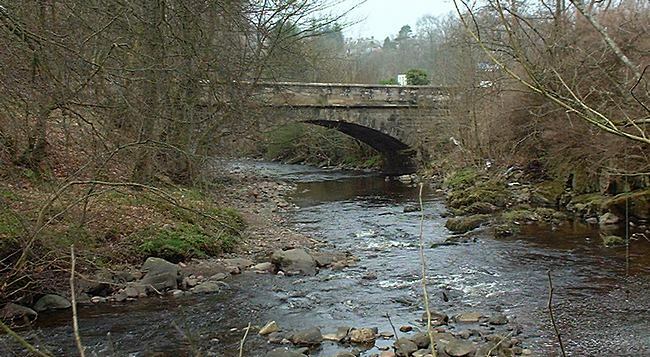 The river Nethan flows through Lesmahagow and on through Auchenheath and past Craignethan Castle down through a gorge to join the Clyde at Crossford. Although it is not a wide river, it carved out a considerable valley, so roads needed bridges to cross the Nethan and its valley. 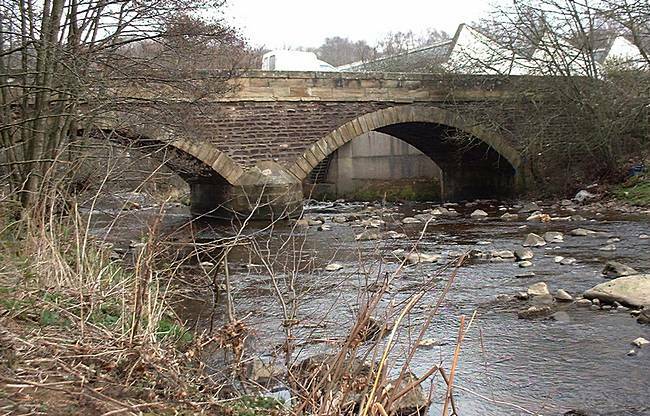 This is the oldest bridge across the Nethan, reputedly built by the monks of Lesmahagow Priory. It carried the original turnpike road. 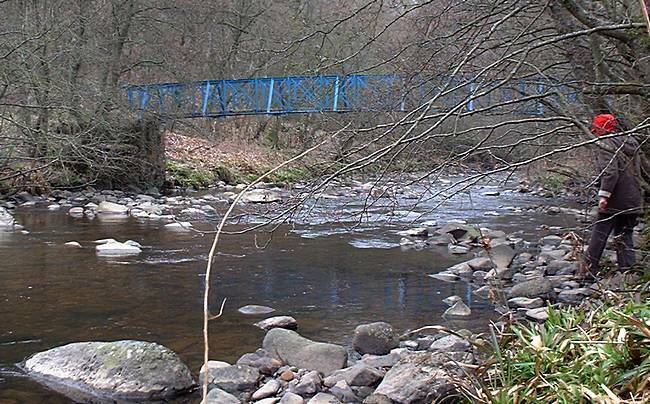 It is still used as a pedestrian bridge between Milton and Pathfoot Smithy. In the 1830s, Thomas Telford, who was constructing a new Glasgow-Carlisle Road, made this new toll bridge not far from the Monks Bridge. A toll house was built at the North end for the tollkeeper. The house was demolished in the early 1960s, but there is a plaque and garden now where the house once stood. The bridge no longer has a purpose and is overgrown and seriously decaying. Plaque about Toll House. All photos: 22nd March 2014. In the 1930s, the Telford road was rerouted with the construction of a new dual carriageway which bypassed the village. Milton Bridge carries the dual carriageway of the old A74 (now B7078) over the Nethan and over the road down into the village joining up with Milton and Abbeygreen. The bridge was opened in 1938. The northern section of the M74 opened in 1969 from the east of Glasgow but ended at Draffan (near Blackwood) when the traffic joined the A74 to pass near Lesmahagow. Later, the motorway was extended from Draffan to Abington and this new section opened in 1991. In Lesmahagow, a railway viaduct across the Nethan was demolished as rail services had long since ceased and a new steel-girdered bridge was built to carry the motorway over the Nethan. Most of the dual-carriageway of the A74 remained and this became the B7078. In 2007, Lesmahagow became a quieter place.The original motorway in the section around Lesmahagow was surfaced with ribbed concrete sections and the expansion joints between the sections were filled with bitumen. For drivers, the increase in wheel noise when travelling over this was very noticeable. For the residents of Lesmahagow, there was a continual hum from the motorway accompanied by the tick-tick noise as the vehicles hit the expansion joints. By 2007, the surface had deteriorated and was replaced by a conventional tarmac surface which was much quieter for all. At the other end of the village main street is Turfholm Bridge which carries the traffic (including bus routes) across the Nethan from Abbeygreen to Turfholm. The bridge is not very wide and has to cater for pedestrians as well with no separate path, Originally it was up to the good sense of drivers to decide who had priority, but visibility across the bridge is limited. In more recent years, the traffic has been controlled by lights. I have not yet found much information on when this bridge was built, but may be around 1800. Turfhom Bridge from the south side. Date of photo: 2nd May 2004. Between the Monks Bridge and Turfholm Bridge, there are two lightweight steel bridges as pedestrian bridges, one in Glebe Park and the other at the back of the Church to connect with an important walkway up to Woodpark at the top of the valley. The entrance drive from Abbeygreen Road to Birkwood House, passes over a single-arched stone bridge of similar construction to Turfholm Bridge. Within the estate, there are other bridges for pedestrians and pipes. Vehicular bridge to Birkwood House and blue pedestrian bridge within estate. Date of photos: 2nd May 2004. Upriver from Birkwood, the Nethan flows around the north of the Auchlochan estate. New Trows Road crosses the Nethan over a hump-backed bridge with a nasty twist in the road. In former times, buses used to cross it and there are many tales of the jolt to passengers as the bus crossed over the bridge. Overall view over the bridge. 16th April 2015. Side view of the bridge. 9th April 2015.